Crews who finish 1st, 2nd, or 3rd in the General Classification are not eligible for Class Awards. In addition, there will be one Team Award, The Manufacturer’s Team Prize, presented to all crew members of the highest placed Team of two cars, where both cars are of the same Manufacturer. All cars mustl comply with the technical code of the event Regulations, and will be examined for compliance at the Scrutineering day held at Brooklands, prior to the Start. All cars entered must retain the standard Manufacturer’s body panels, retaining the original shape and profile and be contructed with the original materials except that the front and rear bumpers, and the bonnet, may be modified or changed for an alternative material. Cars in Classes 1 and 2 may be front wheel drive, rear wheel drive, or four-wheel-drive. Cars in Classes 1, 2, and 3 may be of any age. 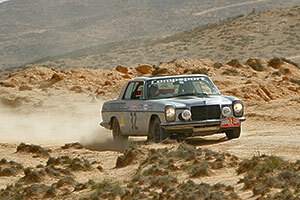 Classic cars in Class 4 or 5 must only be two-wheel-drive. The windscreen must be of laminated glass. Other windows can be changed for alternative materials. The use of heavy tinted material or mirror glass will be restricted. Engines may be modified but must represent either an engine from the same Manufacturer, or, as Homologated for motor-sport. Forced induction, such as turbocharging, is only accepted on diesel engines. Suspension may be modified, uprated or raised in order to meet the conditions of Africa but the general design principles of the Manufacturer’s showroom production car must be retained. For example, leaf-springs must not be replaced with coils if such an example was not the original Manufacturer’s production-car design. All electrical components can be changed or modified. Brake components may be modified. The fitting of alternative fuel tanks is permitted. Seating and interiors may be changed or modified but all cars must retain the Manufacturer’s original dashboard. Wheels and tyres are a free choice with no restriction on type and number carried. In addition a legal requirement in some of the countries, all cars must carry a High-visibility jacket, two warning triangles, and spare headlamp bulbs. The event is a timed Competition. Crews must comprise of two people, of any age, holding a valid driving licence. Changes of crew during the event will not be permitted. *All cars should be prepared within a spirit of self-sufficiency. The organising of pre-arranged service assistance with the employment of strategically placed back-up crews is strictly outside the spirit of the event.